DON’T WASTE YOUR TIME ARGUING WITH ENFORCEMENT AGENTS ABOUT THE DEBT! Don’t confuse Enforcement Agents with debt collectors! This is the biggest mistake people make. By doing so they either wrongly assume a debt collector has powers to enter their home, or, equally as wrongly, assume the Enforcement Agent can be told to just go away. The difference between a debt collector and an EA is that one has the authority of the court behind them, by virtue of a warrant; the other has absolutely no authority or powers at all. If you are unsure as to whether a debt collector or Enforcement Agent is knocking at your door, the quickest way of finding out is to ASK THEM. They are obliged by law to tell you, and any attempt to deceive is a criminal offence. In most instances you won’t have to ask them, because any paperwork they shove through your letterbox in respect of their visit will identify who they are. If you are receiving unwanted visits or calls from a debt collector, then you can simply forbid them from making any further contact with you, or at least any persistent contact that could constitute harassment. 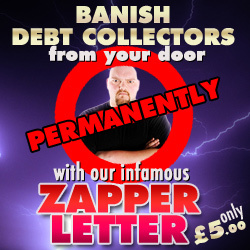 Our Zapper Letter, for instance, is a legally drafted notice which sets out all the laws the debt collector will be breaking if they continue to hound you at home, on the phone, by letter or e-mail, without statutory authority to do so. This letter is nearly always successful, because only the really stupid and unlawful of debt collectors would dare ignore it’s message. This letter will NOT work with Enforcement Agents however, because they have certain rights by law to come to your door and enter your home without your consent. An Enforcement Agent cannot gain entry to your home or seize your goods simply because he is an Enforcement Agent! He must have a warrant that permits him to reclaim the debt. 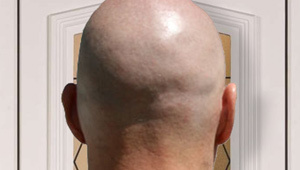 Furthermore, he has only limited means of entering your property: either through an unlocked door or open window. He can’t force his way past you – that is if you are foolish enough to open the door. He cannot break a window to get in, or get a locksmith to drill out your locks, or convince another key-holder to open your door or demand to be let in under threat of breaking your door down. 1) If you were stupid enough to let them in the first time they visited, or they legitimately gained access through an unlocked door or open window. 2) They are repossessing your home. The fact is, the moment an EA legally crosses the threshold of your property, it’s game over as far as keeping them out of the house is concerned. Legislation gives them powers to keep coming back into your home, time and time again, until they have sold off every seized item to reclaim the debt. Another important reason to keep them out at all costs. I could go on for pages about the various powers, warrants, legislation, rights of seizure and tactics of EAs, but they are all concerned with what happens once they enter your home. 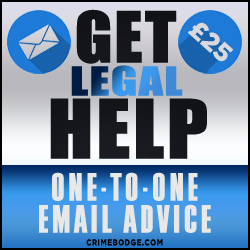 This article is primarily about keeping them out of your house AFTER a court judgement has been issued against you. Surprisingly, all it really takes to defeat the EAs is one simple rule, that if consistently applied, will eventually result in them just giving up, leaving you alone, and moving on to a more responsive prey. Never answer the door to an Enforcement Agent! Don’t just refuse to answer the door, refuse to respond to their knock. You don’t have to hide yourself away the moment they come calling, but you should avoid any kind of communication whatsoever. Don’t even give them the opportunity to describe on their paperwork that they heard a male or female voice asking “who is it?” from behind the door or to describe a face peering out at them from a window. Even if they look and shout through your letterbox, ignore them completely. The trick is to provide the EA with absolutely no response, and to deny them the opportunity to gather details about the person inside. The best method is to make them believe that no-one is at home whenever they come calling. EAs don’t care about the debt, they care about their percentage of it if they successfully collect, or the payment they receive each time they knock at your door – regardless of outcome. If either the EA or the creditor thinks they are wasting their time or money pursuing an empty household or non-communicative occupants they will eventually give up. It may take numerous visits over a period of up to six months before they eventually throw the towel in, but hey, it’s either that or the debt, so take your choice. Keep your windows and doors closed at all times! EAs can only enter through an already open window, but that won’t stop most of them from prying one open if they find it off the latch, and later claiming it was already open. If you are getting regular visits from EAs then don’t take any risks. Keep your doors and windows locked at all times. Even if you are unloading the car with shopping, don’t take the risk of leaving your door unlocked and unattended for even a few minutes. 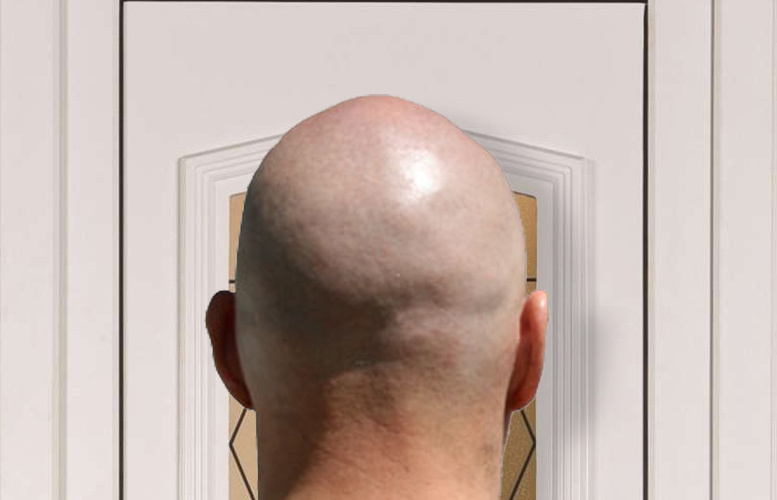 If you don’t have a spyhole in your front door then get one. Or maybe mount a security camera. You are going to need a way of ascertaining who is at your door when people come calling, which doesn’t mean peering out of a window or through a security chain. You need to see their faces, but you don’t want them to see yours. Any identification they can make – no matter how vague – will be sketched down into their notes and used as further evidence that they are pursuing the right person. Preferably about six streets away, or on a friend’s or relative’s property. 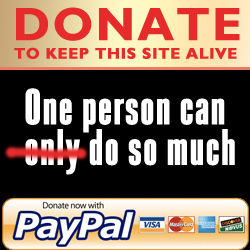 If you don’t, then you can guarantee that the EAs will seize it. And don’t think you can fool them by parking it on your neighbour’s drive, or across the street. EAs are familiar with this tactic and will search many of the surrounding streets in the bid to find your vehicle (easily done if they have the registration number or an automatic number-plate recognition device). Vehicle seizure is the most common way that EAs reclaim debts and if you have received a county court judgement against you recently, then you can be rest assured that your vehicle will be targeted. So either find a secure place to park it – such as a locked garage (EAs cannot use force to enter garages) or start parking it a sizeable distance away from home and walking the rest of the way. But don’t tell the police that the person at your door is an Enforcement Agent. The police are notorious for siding with EAs regardless of how bullying, thuggish or intimidating they behave. Don’t give the police the opportunity to dismiss your appeal for help as being ‘a civil matter’ or an excuse to arrive two hours late. Just tell them that there is someone at your door acting in an an intimidating manner, making demands that you open the door and you suspect they mean violence. If the police ask if it has anything to do with debt then just tell them you don’t know who it is because you are too scared to open the door. Don’t think you are in any way ‘wasting police time’ by doing this, as you are not. 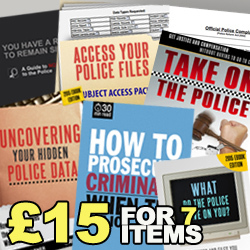 Most bailiffs won’t think twice about enlisting police officers to help them intimidate a debtor into letting them in under the mistaken belief they will be arrested if they don’t. The police are happy to loan their assistance in deceiving others in this way because they regard EAs as one of their own and have a low opinion of anyone who hasn’t paid a debt. Unless they are carrying their own warrant, the police have no powers to demand you open your door to allow EAs in. If the police arrive with EAs don’t be frightened or intimidated. This is exactly how they expect you to react. The police’s only function is to ensure that there isn’t a breach of the peace. Better still, just ignore them as you would the EAs. Refusing to answer the door in these circumstances, speak to or assist the police is not an offence, obstruction or an attempt to pervert the course of justice. Any police officer who attempts to convince you otherwise is breaking the law. In conclusion, all of this advice may seem obvious and straightforward, but I cannot stress enough just how effective it is. Remember, avoid saying so much as a single word to the Enforcement Agent and ignore every attempt they make to communicate, if you want them to eventually give up and leave you alone. Your outstanding debt is an entirely different matter however, which is between you and the creditor. Avoid that at your own risk. Be aware that just because you may have succeeded in banishing the EA from your door does not mean the creditor is defeated. They could still apply for an attachment of earnings or even a comital order. EXTREME CREDIT FIXER is a last ditch approach to escaping overpowering debt. By following the methods carefully set out in this Ebook you can effectively set-aside any outstanding debt and build a new credit history from scratch. These little know techniques rely specifically upon the lawful process of adopting an identity that you can use exclusively for your financial dealings, while maintaining your existing name for everything else. To find out more about this Ebook please click here, or to purchase for immediate download please use the Paypal link below. This Ebook is supplied in .PDF format and is viewable on any device. 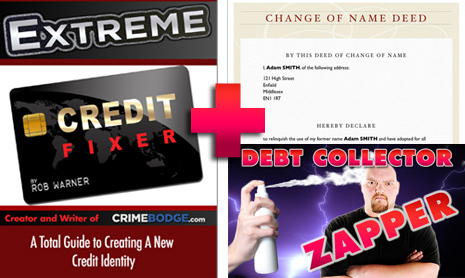 For the next 30 days we are giving away our infamous debt collection Zapper Letter for FREE with each purchase of Extreme Credit Fixer. A tried and tested way of stopping the unwanted harassment of debt collectors dead in their tracks. We are also including COMPLETELY FREE all the templates you need to create your own change of name deed-poll. 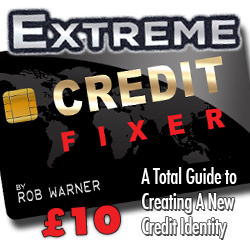 Explained in depth within Extreme Credit Fixer, which is vital to creating a new and totally legal credit identity.